Satisfaction Guarantee .... If you are not satisfied, just say so. I'll refund, replace or let you select another introduction .... no questions. 4-16-2019 I have been thoroughly enjoying reading you stories, insights, and observations concerning your introductions. It is nice to hear the thoughts going into the naming processes and the backstory .… along with evidence of why your intros are an improvement. D.M. 3-14-2019 I’ll be attending …. the much anticipated 2019 AIS Convention in San Ramon. I’m already anxious to see and do everything that the Convention has to offer: garden tours, “sectional” programs, renewing “old” and making “new” friendships, judges trainings, boutique and 10 more exciting things! 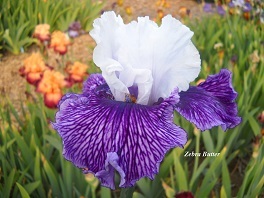 If you like or even dislike what Mariposa Iris and my Iris From the Future are doing …. this is your opportunity to let me know. Let's chat! 2-28-2019 TIJUANA TAXI attained the Symposium list .... yet was only a 2014 intro. Our first! 1-15-2019 Here they are! My two new beautiful and exciting intros for 2019 …. APRON STRINGS and BUTTERFLY SKIES. I think you will find the pictures and text very interesting. With that, my 2019 order book is now open. 1-8-2019 Here comes the new iris year! Under the heading of “Late But Worth Noting” is that I routinely plant my iris seed mid-November … and never later than Thanksgiving. How deep? I ran a small experiment that went like this. I had been planting seed at only one-half inch deep with satisfactory results. In the experiment, I significantly increased the depth to 1.5 inches deep. SAME RESULT! Near identical germination. So this year, I compromised and planted all of the seed at one inch deep. Since I routinely get plenty of rain and cold, I do not pre-treat the iris seed in any way. At this minute, I am working on the text for my two new TB introductions. I always target completing the entire task by the end of January. 7-10-2018 Not much time!!! The window on this iris season is closing. Last day to have your order in my hands is August 1,2018. 5-13-2018 Regional results held May 11-13 for our iris. Thank you judges! 5-16-2018 Evidently a lot of iris dealers run out of stock during the ordering season. Consequently, I get a lot of inquires as to availability. My answer is always the same. All of my website offerings are still in stock and are expected to remain that way right up until the season cut-off day. 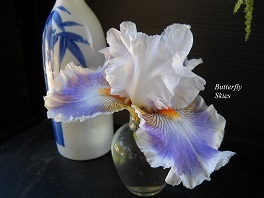 Last day to order iris from Mariposa Iris is August 1,2018. May 11 - 13 Region 14 Spring Trek. I have one of the two guest gardens for those that have registered for this event. The bloom will be somewhat ahead of peak bloom. Sunday May 20 from 11 A.M - 4 P.M. Annual iris Fundraiser! I’ve been holding this much-anticipated event since 2000 …. 18 years ! 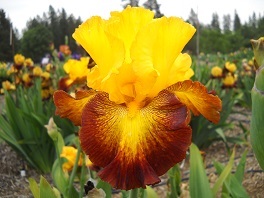 3-7-2018 My 3-page article, “Two Hybridizing Advancements: One Intentional, One Accidental” was published in the Winter 2018 issue of Irises …. Pages 16-18. My hope is that hybridizers will utilize these two discoveries in their own gardens. The result should be more pods set on the more difficult plants. And the final result of that will be to advance the kingdom of iris with flowers that otherwise would not have been created. 2-8-2018 I have been a bit slow this year, but my two new introductions are finally up on my website. FLORENCE MY PET FLAMINGO and GLADIATORS GET OUCHIES are wonderful flowers. These two bring breeding advancements to the kingdom of iris. And, as you would guess, both have very interesting stories to help explain their unusual names. 12-2-2017 Two nice trophies arrived in the mail today. Thank you region 14! 11-4-2017 If you purchased iris during our annual fundraiser, pick-up week is Tuesday November 7th through Saturday, November 11th. Our hours are 10 A.M. to 5 P.M. The gardens will also be open so bring your gardening questions and a friend. 8-17-2017 It’s mid-summer in California and we are approximately in the middle of what I call “dust season”. Being from the mid-west (Toledo, Ohio area), my biggest complaint “out here” is the length of “dust season” …. it’s too darn long! But the bight side of this is that a well established clump of iris DON’T CARE. 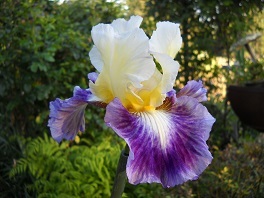 Iris are EXTREMELY drought tolerant …. far more than the average Irisarians believes. It normally doesn’t rain for 6 months at my location and I virtually never water established clumps. They don’t care. Without water, they just go into a natural summer dormancy. 7-23-2017 There was a recent, major fire event in the Mariposa area that got national attention. The fire was confined to the south and west portions of the county, while I live on the opposite side of the county. So, MARIPOSA IRIS was relatively un-affected. 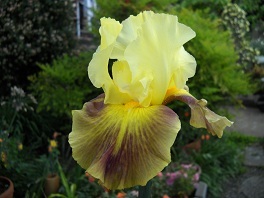 We did however, receive many positive and appreciated comments from our iris friends. Thanks. I supervised prisoner firefighting hand crews for 25 years. So I am very aware of how to fireproof my surroundings ….. which I have done. If you hear the two key words …. MARIPOSA and FIRE …. in the future, you can be pretty sure that I’ll be just fine. Superstition Iris Gardens is located close to the southern fire perimeter, but they were also un-affected. Their property is also quite fire safe compared to the average Mariposa address. In the mean time, let me only announce that the last day to order iris is 8-15-2017. 5-23-2017 Both the Annual Iris Fundraiser and Judges Training were big successes this year. Over the 2 day period there were perhaps 200 happy people for both events. The bloom was right at peak. Now I’m off to Iowa to attend the National Convention to rub elbows with Irisarians from all over the country …. and a few from other countries as well! 5-5-2017 Yes! The annual fundraiser will be Sunday May 21st from 11am to 4pm. See you then! 4-29-2017 While not yet official, my iris field is telling me that our HIGHLY POPULAR iris fundraiser will most likely be held Sunday May 21st. When the date is set in stone, I will let you know right here. Also, we are hosting a Region 14 judges training on Saturday May 20th at noon. 4-28-2017 My wife and I just returned from the Region 14 Spring Meeting where we were awarded two firsts and a second place out of 160 iris submitted. 3. JELLY BEAN PARADE …. Second best introduction prior to 2017 by a Region 14 hybridizer. 2-27-2017 At the moment, I have to keep reminding myself that the iris don’t care. As I sit here today, in the middle of a late February afternoon, it’s 30 degrees and dumping snow. We are experiencing a very long, cold, & extremely-wet winter. But for the serious hybridizer, there is a silver lining to the bad weather …. it sorts out the strong from the weak in the seedling beds. So I find it more correct to say: the good iris don’t care. 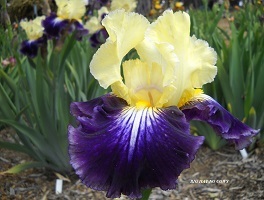 A good iris will put on a great show …. regardless of the winter weather and I'm thankful for it! 1-29-2017 In case you didn’t notice, my two new 2017 introductions are now on the web page. TROPICAL FRUIT SALAD and ZEBRA BUTTER are exciting flowers that easily meet my rigid criteria of being 20% Better or 20% Different. Yes, both are also Good Growers and both have a high degree of Curb Appeal. As usual, there is considerable text for each intro. I always attempt to tell the Irisarians every detail that there is to know about the flower to help take the “guesswork” out of selection. From the numerous comments that I hear, people love the text and love the names that I use. Is there anything else that you like that I do??? 10-31-2016 Announcing IRIS PICK-UP WEEK! If you bought iris during the Spring Fundraiser …. 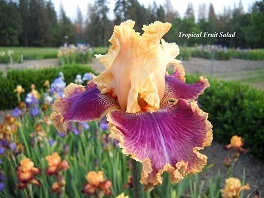 It’s almost time to come and pick up your new iris children. PICK-UP WEEK starts Monday Nov. 7th and ends Friday Nov. 11th. Hours are 10AM - 5PM. Another way of saying this is that I have never introduced a flower that I now regret introducing. 8-17-2016 Digging, dividing and re-planting time is when our industry separates the men from the boys and the dreamers from the realists. This is when you find out who the “real” iris growers are. 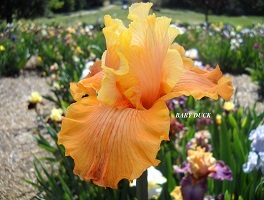 Almost anyone can entertain visions of becoming an iris grower in the middle of spring bloom season. But the real work, …. the serious heavy-lifting …..is done in the depth of summer. 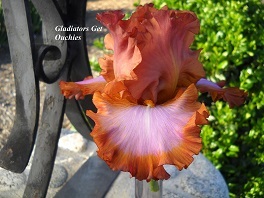 This is when your shovel bounces off the bone dry ground, sweat starts to flow into your eyes at 9 a.m. and that “big clump” of one of your favorite iris, is no longer an asset …. but a huge liability. Spring is enjoyment-season. Summer is work-season. Are you up to it? 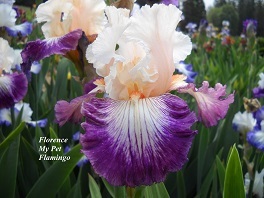 6-23-2016 It’s time to start thinking about finalizing your iris purchases for this year. “Digging Season” is very soon to come. 6-12-2016 The last time we experienced mail theft was about 10 years ago. Well, everyone in our neighborhood experienced mail theft on June 10th and 11th. If anyone happened to send in an order in this timeframe, know that I always acknowledge iris orders in one or two days by e-mail (if have your address) or by using conventional mail. So, if you don’t hear from me, I didn’t get it. Sorry for any inconvenience that this may have caused. 6-2-2016 It was a very exciting and splendid year in the new seedling patch! There were many new patterns, colors and color combinations to be seen. Several of the seedlings were more beautiful and interesting than anything that I could imagine. Where to from here? In the first year, you look for everything that you LIKE about the seedling. In subsequent years, you look for everything that you DON‘T LIKE. The serious “evaluation period” now starts as I look for the inferior qualities that were minimized in selecting the maiden seedling. If the past is a guide, many won’t make it to the final finish line. 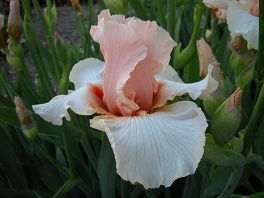 But those that do will be deserving of eventual introduction as yet another Iris From The Future. 5-9-2016 We had a very large turnout for both the Judges Training and the Iris Fundraiser. With the flowers in peak bloom, there were smiles and flowers everywhere in abundance. Thank you to everyone that came and especially my garden volunteers. 5-6-2016 The weather is plenty good enough and the bloom is spectacular. So YES on the May 7th Judges Training. And YES on the Iris Fundraiser May 8th. 4-1-2016 Hey! The day that several have been anxiously waiting for has finally arrived. As of today, all of my introductions are now available for ordering including TIJUANA TAXI and WHY COWS GOSSIP (Why do they gossip?) Click on the flower and then read the text. 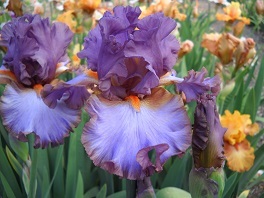 There has been a great deal of interest in these two stellar Iris From The Future. 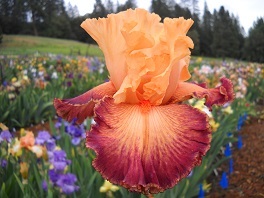 They were the two big, TB, Out Of Region winners at Portland last year and each deservingly got several mentions in our fall and winter Irises Bulletin. 3-2-2016 NOW IS THE TIME …. 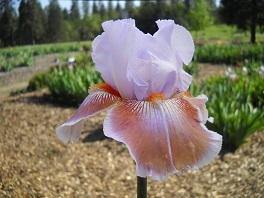 To pull back mulch, weed and fertilize your iris. (Actually it’s a little on the “late” side for the warmer climatic zones.) I create a 6 or 8 inch wide “no mans land” around each plant. The trick is to do the above just a little BEFORE the new, tender spring growth (increase) begins to emerge. This new growth is what will develop into your bloom stalks and increase. So you need to be extra careful not to injure these particular, tender parts of the plant. Doing the above in February-March when cold, frosts and snow are still yet to come, will seem way too early. Well, it’s not! And that is from the voice of experience. 1-21-2016 It’s done! My website has recently been updated for 2016. I will be offering two remarkable TB’s this year. BIG HAT NO COWS (improved Edith Wolford colors) and BABY DUCK (second best seedling at Portland). I had expected to introduce a third iris TB. Everything about it seemed to be a go, but then it failed it's final test. An extremely colorful flower, #0467 performed below my expectations in the Portland convention gardens. Too bad, I even had a special name reserved. But then again, my commitment to quality won out …. as it should! Sales for TUJUANA TAXI and WHY COWS GOSSIP will resume on 4-1-2016. Everything else can be ordered at any time. 12-22-2015 Our 4 years of EXTREME drought my have ended with a 4 inch rainfall received yesterday. Sure hope so. What have I learned? During the rain-sparse winter of 2014-2015, the moisture level never penetrated any deeper than about 6 inches. Below that, it was dust! The only iris that I watered for the past 4 years of drought were new seedlings. 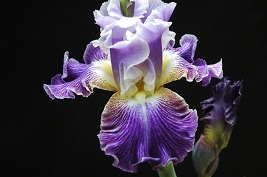 Established clumps of all categories of bearded iris were NEVER watered. Yet the only negative that I noticed was somewhat smaller rhizomes and fewer “takes” while hybridizing. What was done to preserve moisture? Two things. Established iris clumps are heavily mulched right up to base of the plants except when it is pulled back from February to late May …. the rot prone period. Second, I keep the iris field free of moisture robbing weeds. Conclusion? I’m quite sure that iris are FAR more drought tolerant than almost everyone currently believes! 11-13-2015 The two important numbers for this year are 131 and 1711. 131 is the number of different, successful crosses that I ended up with this year. Heaven knows how many I actually attempted, but didn’t “take”. I doubt if one-in-four of my attempts results in seed. But then again, I always attempt wide, wild crosses that are more prone to failure because I’m only looking for flowers that are representative of Iris From The Future. It took the better part of two days to plant the 2015 seed and left-over seed from 2014 when germination did not succeed. The percent that actually make it through germination is always a coin toss. 1711 is the number of different crosses that have produced seed over the years. The number is actually larger, but I didn’t keep records from the earliest years. I’m extremely critical, so the result of all this work will only result in two TB intro’s for 2016. Both are outstanding! You have to kiss a lot of frogs to find a princess or two. 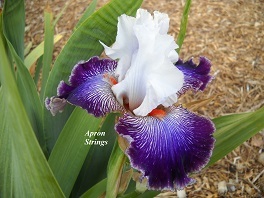 Because of my love for iris, I never find myself growing weary of the hybridizing challenge. 9-18-2015 I contend that there are 3 classifications of gardeners, and 2 of them are un-happy. The first classification is the beginner. They have discovered gardening but are un-happy because they still don’t have “enough”. The second classification has the perfect balance between space for their plants and time to take care of them. They have reached “the happy medium.” The third classification has over-expanded to a point of now having too much to do and not enough time to do it. The way that most people cope with this it to just give up. But that doesn’t have to be the outcome. The solution? DOWNSIZE or as my wife prefers, RIGHTSIZE until your garden is once again both manageable and fun. 8-26-2015 As a recent attendee and contributing hybridizer to the latest AIS convention held in Portland, I think I can make a couple of observations. It’s very obvious that it takes a well-organized army of competent people to put on one of these stellar events. At every turn and everywhere you look, there seems to be someone performing an official function or attending to some important detail that contributes to the overall success of the event. Actually if the truth be told, I think that the hybridizers are a bit too overrated at these events while “the silent army” is vastly underrated and under appreciated …. But not by me. It’s not possible to individually thank everyone of you for your contributions. So, I too-simple “THANK YOU” from myself will have to do. 8-1-2015 LAST CALL! It’s still not too late to order. Orders will be accepted until August 15th. NO WAITING. Orders will be immediately shipped. 7-26-2015 They’re reblooming, but why? Perhaps 10% of my iris started blooming 3 weeks earlier than normal, and just kept on blooming and blooming! None of the “peculiar ones” are listed as RE, nor have they done this in the past. Two possibilities come to mind. We have been in EXTREME drought. So soil moisture could be a factor. Second, even though I live in Zone 7, we did not have a winter. Aside from 2 days last November and two days in March, it was a “shirtsleeve” non-winter. My hunch is that the non-winter was responsible for the unusual, much-extended bloom cycle. I think it would be a mistake to think that this group are RE. If you experienced something similar, this was a false RE signal and should just be ignored. Best Seedling: First, ROYSTON RUBIES TB 36 votes. Second place, tie, w/22 votes each, RUBICON Species X & our yellow & orange, line & speckle seedling #0439 (Which will be named and introduced in 2016). We were tickled to have 3 in this elite group. Location Don’t be fooled by my California address. Our mountainous, pine-forested location, with Yosemite National Park practically in my backyard, comes with the GOOD and the BAD. more..
"More than Wonderful... Fantastic creations and look at all those intricate veins! You are a true hybridizer coming up with unusual & different. Your website is amazing and all your creations." R.S. "I am excited to have my husband come out to your beautiful place, I have been telling him all about your gardening tips, you are wealth of information. I truly enjoy our visit with you." K.T.